Light fixtures and the light they produce can be somewhat of a mystery. 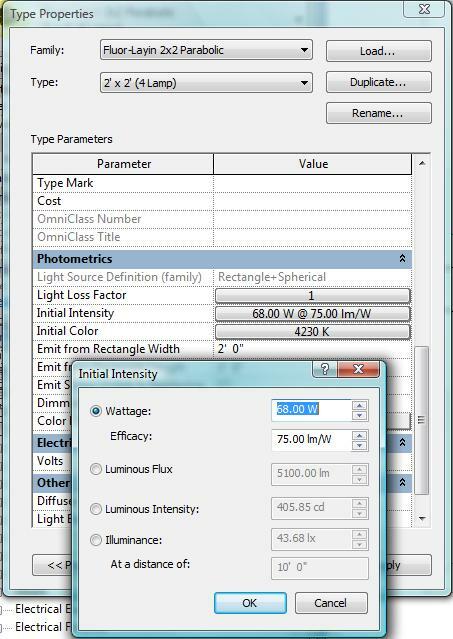 When you enter into the ‘Type Properties” of a light fixture the primary control for the light intensity can be found under the button to the right of the Initial Intensity parameter. Once you’ve activated the dialog select the “Wattage” radio button. You are now faced with two inputs. You will need to know three things to complete these inputs. 1. The number of lamps in your fixture. 2. The wattage of each lamp. 3. The initial lumens produced by each lamp. The first value “wattage” is achieved by multiplying the number of lamps times the wattage to get the total fixture wattage. The second value “Efficacy” is acheived by dividing the lumen value for a single lamp by the wattage for that individual lamp. So a 17 watt lamp producing 1275 lumens has an Efficacy of 75. If you are creating a light fixture, you want to make sure the color temperature matches the lamp type and the light source is of a similar light distribution pattern that matches the lamp configuration. Here are some sources for lamp data. You should use Mean Lumens not initial. Mean Lumens would result in a light intensity indicative of lamps that have been installed for some time and have lost some lumen output due to dust or lumen fallout which occurs as you move futher into the lamp’s projected life expectancy. Initial Lumens would give a light quality indicative of lamps that have been newly installed. The use of Mean vs. Initial lumens depends on how you intend to depict the space light quality.